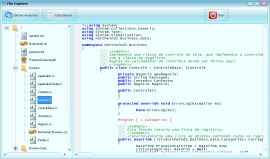 izCode - .Net and Java Software Generator , providing up to 90% reduction in development time and up to 70% in costs. .Net Program Generator. 90% of reduction in the time of development and up to 70% in the costs. 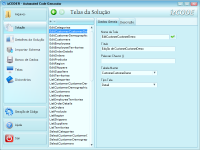 Just download izCode free and start to generating software and save time and money. Import your project through a simple and easy wizard importer. 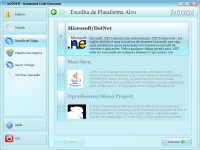 DotNet, Java, Web, Desktop, Mobile, simply choose, and your software will be generated automatically. We can also help you offering a full software development service. Speeding up the process of development, and allowing you to focus even more on what your company does best, your business. Fast, Easy, Online, Customized. Start right now! The initial step to generate your software, you have to import your database with the import wizard. After import, you can add information about the tables and fields in order to improve the final generated code. Parametrize the information from each screen to be generated, improving the final generated code. Simply choose the platform on which you want your software to be generated. Wait while your software is created, it usually takes less than 1 minute. After generation, you can browse through all the generated code.